An entire half sheet pan full of peanut butter-oat bars loaded with chocolate chips and topped with Reese's Pieces. Preheat oven to 350 degrees F. Lightly grease a 13x18-inch half sheet pan. With an electric mixer, beat the butter and both sugars together on medium speed until light and fluffy, about 3 minutes. Scrape down the sides of the bowl and add the eggs, one at a time, beating well after each addition. Add the vanilla extract and baking soda and beat to combine. Using a rubber spatula, stir in the peanut butter until completely combined, then stir in the oats, then the chocolate chips until all of the ingredients are fully mixed together. Turn the dough out onto the prepared baking sheet and, using your hands, press into an even layer (the dough may be slightly sticky, in which case you can dampen your hands to keep it from sticking). 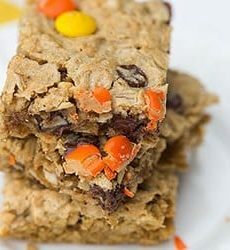 Sprinkle the Reese's Pieces on top and gently press into the dough. Bake until the bars are just lightly browned and no longer look wet on top, 15 to 17 minutes. Remove from the oven and allow to cool completely before cutting into bars. These can be stored in an airtight container, at room temperature, for up to 1 week. Note: If you do not have a 13x18-inch pan and want to use a 9x13, cut all of the ingredients in half. You may need to start checking for doneness a few minutes early.